Creating more diverse journalism can’t just be about slotting people of color into the newsrooms we have, it has to be about transforming our institutions, our culture, and our storytelling. I’ve written before about the need for newsrooms to better reflect the diversity of their communities. This work isn’t tangential to creating more sustainable, impactful and engaged journalism, it is central to it. 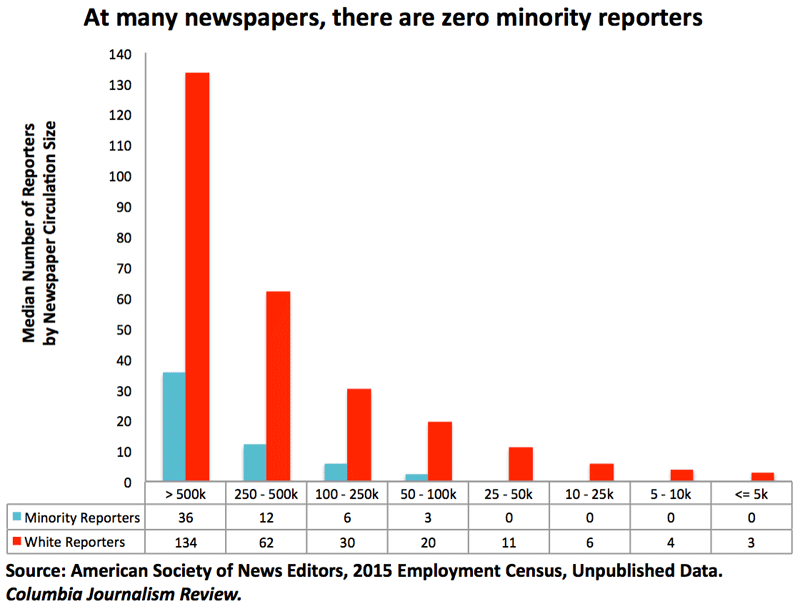 You may have seen the headline this week over at the Columbia Journalism Review: “At many local newspapers, there are no reporters of color.” The piece is a follow-up to an earlier article where Alex William examined how unequal hiring practices, not the number of qualified candidates, contribute to lack of diversity in America’s newsrooms. While the Columbia Journalism Review piece focuses on local newsrooms, the International Business Times reported on the percentage of people of color working at the biggest new digital media outlets, concluding that most lag behind legacy media. Chart by Alex William and the Columbia Journalism Review. But those two pieces don’t give us the full picture. A few days after the CJR and IBT articles were published Gene Demby at NPR’s Code Switch blog wrote about what it is like to be a black reporter covering violence against black communities. His post should be mandatory reading. 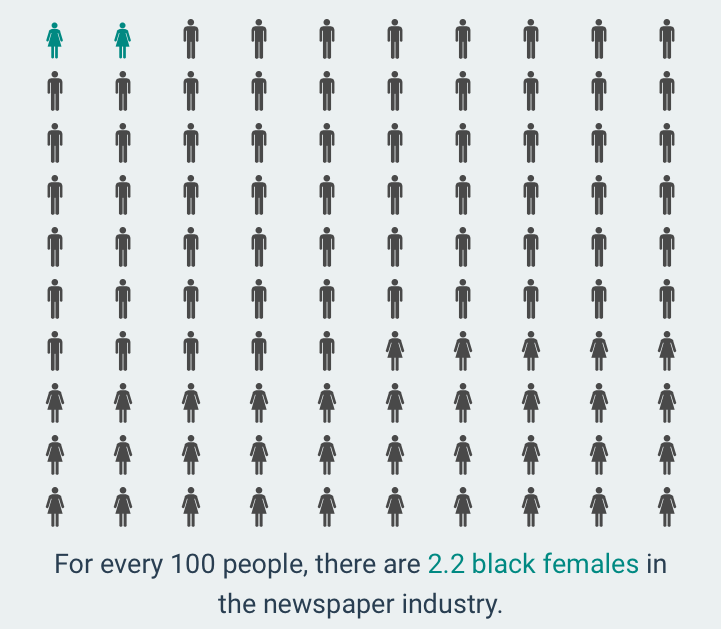 Screenshot from Poynter’s interactive on media diversity. Data from ASNE. While I have focused for the most part on media diversity as an issue within newsrooms, it of course, has bearing outside the newsroom, on the communities we cover and serve. I spent years working on media diversity issues with Free Press, and traveling around the country I heard from community leaders and local residents about how rarely they felt like they saw their lives and their voices reflected in the news. This issue gets at the heart of what journalism is and what it does. It is about telling the full truth of a story. It is about accuracy. It is about ethics. The Society of Professional Journalists’ code of ethics includes, “Boldly tell the story of the diversity and magnitude of the human experience. Seek sources whose voices we seldom hear.” Too often, we are not living up to that promise. As an industry we’ve largely embraced the digital transformation of news. In this moment of profound change we cannot just invest in creating more digital newsrooms, we have to embrace and celebrate the work of creating more diverse newsrooms too. If we don’t, then we aren’t doing the best journalism we could be. We aren’t creating the best newsrooms we could be. We aren’t taking care of each other the way we could be. We aren’t serving our communities as well as we could be. How are newsrooms responding? At Poynter Lauren Klinger profiled how Feministing has taken an intentional approach to fostering media diversityacross their organization. The piece touches on a number of the themes discussed above. Poynter also recently reported on how the NPR Visuals team is “trying to reduce the effects of privilege” in the hiring of interns. From sharing interview questions in advance to letting people revise their cover letters, the team wants to level the playing field, recognizing that different people have access to different coaching and job prep networks. ProPublica recently published their newsroom demographics and outlined what they planned to do to foster more diversity in their newsroom but also the field in general. There is more to say on this topic. I haven’t even touched on gender equity and the recent report on women in the media from the Women’s Media Center. Until we can have that discussion in all our newsrooms, and move it toward meaningful action, we are not doing enough. This post is an excerpt from the Local Fix, a weekly newsletter on journalism sustainability, community engagement and newsroom innovation. Subscribe to the Local Fix: tinyletter.com/jcstearns. The Local Fix and the Local News Lab are projects of the Geraldine R. Dodge Foundation, with support from the Knight Foundation.